Although pegged as a “troll” by Lance Armstrong, it should be noted that David Walsh is not a shoddy tabloid journalist but is instead the award-winning chief sports writer with The Sunday Times (London). He is a four-time Irish Sports Writer of the Year recipient, and a three-time UK Sports Writer of the Year recipient. 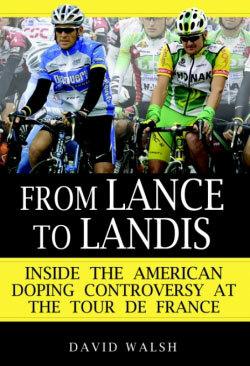 Having said that, “From Lance to Landis” reflects clearly Walsh’s journalistic and investigative skills. He conducted many hours of interviews with numerous people, the results of which are many new and different angles on doping in cycling. In addition to the more well-known characters such as Willy Voet and Hein Verbruggen, we are introduced to an entirely new cast in this ongoing drama such as Rene Wetzel, Greg Strock, Dr. Michael Ashenden, and Stephanie Mc Ilvain, among many others. Walsh shows his insight in his analysis of the available evidence, and uses it to help you paint a picture of the current status of the sport on your own. Walsh respects the reader’s own intelligence and judgment, and let’s you draw your own conclusions based on the evidence he has gathered so carefully. For those already well-versed in the doping story, this is not ground-breaking information. However, Walsh provides much new information and he does this with much insight and intelligence. Many of the doping cases of the past several years have been dissected carefully, and the gaps left by the lay press have been filled in by Walsh. Therefore it is a must read for anyone interested in the current “health” of cycling and the peleton.